Linné on line – What are northern lights? The cell – a living microcosmos? Quarks and leptons, the smallest building blocks of matter? Linné on line Physics and the Cosmos Macrocosmos The sun What are northern lights? During his travels it could happen that Linnaeus saw northern lights. 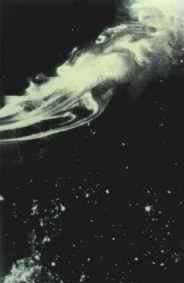 In those days there were many different types of speculations on the origin of this phenomenon. Since northern lights are explained by atomic and particle physics reaction, which in those days were unheard of, these ideas appear as very farfetched today. The particles that give rise to northern lights originate from the sun. They come with the solar wind from the sun and are captured by the earth’s magnetic field. The motion of the particles is determined by the shape of the magnetic field. At the poles the particles can reach deep into the atmosphere since the magnetic poles are close to the geographic ones. When the particles reach the atmosphere they collide with the molecules there. This will excite the molecules and when they return to their ground state they emit the absorbed energy in the form of photon radiation. These photons will have different energy, producing different colours, depending on which type of molecule that was involved: for example oxygen (O2) gives green light and nitrogen (N2) red. Since oxygen and nitrogen are the dominant gases in the atmosphere it is clear that northern lights will be dominantly red and green. Picture of northern lights above Scandinavia taken by a satellite. Cities are seen as bright dots on the picture. Auroras are most visible when you are inside the Northern Lights oval. In the Nordic countries, you might find it in Iceland, northern parts of Norway, Finland and Sweden. There are several places to visit in Sweden but Abisko is the place not to miss out on. The Aurora Sky station offers an incredible experience and stunning views over the sky and surrounding landscape. Lonely Planet deemed this to the best place in the world to watch the Northern Lights (2015). 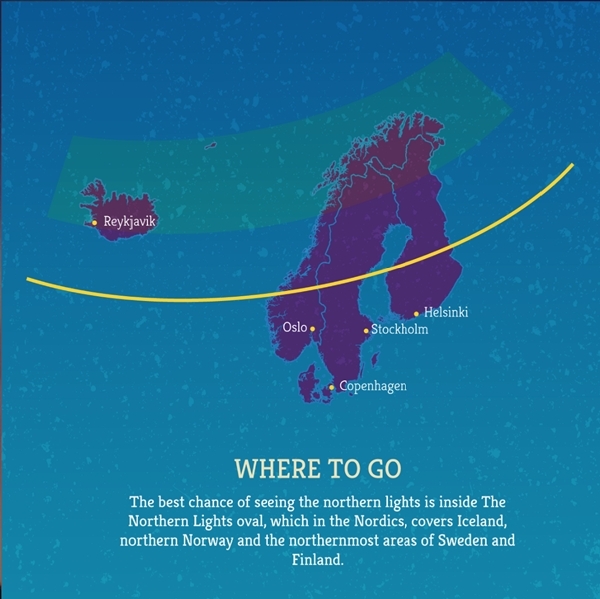 If you stay in Abisko for three days, you have an 88 per cent chance of seeing the northern lights. Here you get an opportunity to see the northern lights and staying in a ice hotel at the same time. Why not book a husky tour to see the nature simultaneously? All of this area is a quite safe card to catch some northern lights. During the peak of the season (December – March) you will see it every second day. The northern parts of Norway can be tricky to get to and for that reason Tromsö is the destination to aim for. A lively city with lots of culture and where the chance to experience Northern Lights are high. Reykjavik is a splendid choice to see Northern Lights in Iceland! From here it’s also a very short route to the famed Blue Lagoon. In Finland you can experience both Northern Lights and Sami culture in the Utsjoki. Here you can experience the Sami lifestyle and culture and learn how to become one with nature.